In his literary tribute, Agee was praising “Famous Men,” impoverished tenant farmers during the Depression. Along with photography by Walker Evans, his book not only gave a journalistic and humanistic account, it gave credence nationwide to the New Deal policies of President FDR. Occasionally, a work of art can move a viewer, even a nation, to act on its conscience. Art can be altruistic. It can benefit humankind. That is, if the art is powerful and creative enough to give life to its message as was the case with Agee’s writing and Evans’ imagery. The goal here is simply to recognize and appreciate an artist and art exhibit without an ulterior motive. In a postmodern era half in love with art by advocacy or social conscience, where an exhibit’s issues often over-shadow its work on display, The Moving Gallery offers the surreal and sensual photography of French artist Nicolas Dhervillers. 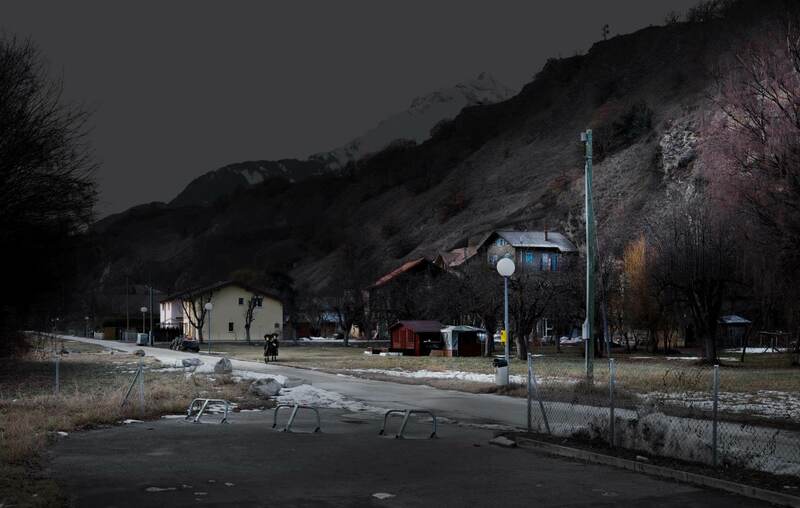 Dhervillers’ haunting landscapes, photo montages essentially, are currently exhibited until April 1 in the Garden of the Zodiac gallery in the Old Market Passageway. 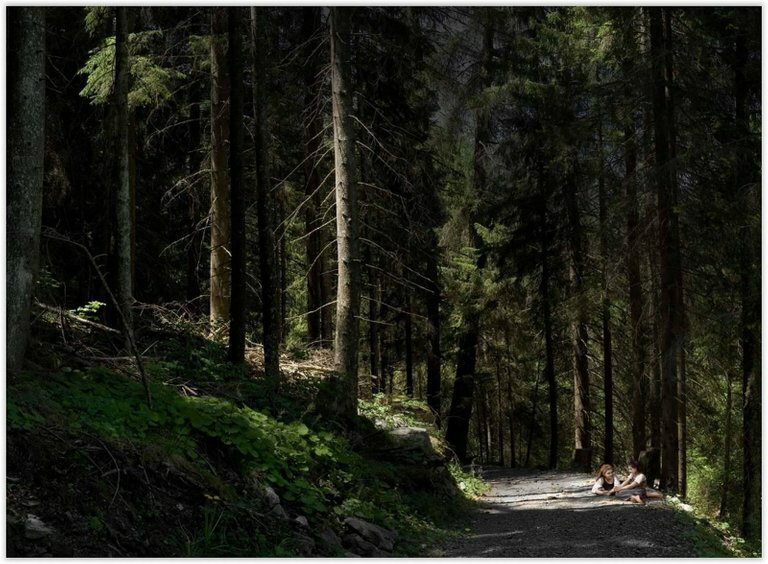 Mostly monumental works, all 14 photos represent a survey of five of his series: Sentimental Archives, Hommages, Detachment, Road Movies and Ocull II. The first four series dominate this hauntingly beautiful exhibition because their inherent narratives within each frame capture not only the eye but also the imagination. Utilizing digital darkroom while referencing classic cinematic technique and style, Dhervillers creates an atmospheric set piece that beckons the viewer first with its suspense and then seduces one with its psychodrama. His process-heavy aesthetic includes nods to day-for-night cinematography of mid-century film directors, deep focus composition, extreme long shots rather than close-ups, dark murky backgrounds, a muted palette and low res lighting except for one sharp well-lit, deliberate stage. Most of all, the artist creates like a film director who assumes the role also of production designer, cinematographer, special effects coordinator and editor. The dominant technique in his “film” however is not editing or the moving camera but mise-en-scène, a term borrowed from theater that translates loosely to the “placing on stage,” or in this case, within the frame. In cinema, mise-en-scène refers to everything that appears before the camera. This includes composition, sets, props, actors, costumes and lighting. The mise-en-scène, along with the cinematography and editing of a film, influences its believability of in the eyes of its viewers. The various elements of design help express a film’s vision by generating a sense of time and space, as well as setting a mood, and sometimes suggesting a character’s state of mind. Regardless of Dhervillers’ series, every photo then is a single shot that seems to speak for, or at least suggest, an entire scene, if not an entire sequence in his “film”. Though each scene is unique, each is oddly familiar, either because it may remind one of a past movie, a famous painting or even a distant nightmare or memory. The connection isn’t exact. It’s not meant to be as Dhervillers is speaking to not one person but a collective unconscious. We can enjoy each image together as if sitting in a theater but it is difficult to share out loud as we relate only individually, psychologically, as to what each piece means. Yet there is no denying the atmosphere and the feeling solicited. From there we may even struggle to analyze, let alone interpret. But at no time does the artist retreat to the hackneyed cop out of: “It means whatever you want it to mean.” Nor does he intend to explain the work for us either. In his artist statement, Dhervillers is careful and creative enough to provide clues or keys, tropes even, in each of his series to stimulate curiosity, conversation maybe, without explaining the work away. Dhervillers’ Hommages series draws its characters from history paintings and cuts and pastes them into unique landscapes, a practice that originally began with his “Tribute” works. He sources primarily figures from 17th and 18th century Flemish and French masterpieces. Overriding themes in this work include the romantic myth of abandonment and the quest itself for identity. In “Hommage a’ Bouguereau II,” two barefooted young girls sit forlorn in a dark evergreen woods. Not straying from the path, these two lost lambs, bathed in a beatific light, await their fate as twilight approaches. The work is certainly a paean to Bouguereau’s classical, academic style, but the setting and the diminished figures and their predicament is less than ideal. As with “My Sentimental Archives,” Dhervillers’ mise-en-scène offers another paradoxical dilemma. The Road Movies series may be Dhervillers’ most obvious use of genre given their renewed popularity in current cinema, but they are no less enigmatic in his exposition. Commissioned by the International Automobile Festival, Dhervillers implanted legendary cars to travel across his vast imposing landscapes, then created fictional montages and dramatic narratives for us to enjoy. “Untitled 8,” features a Citroen SM pulling away from a chapel, not in the vale but sitting precariously on a cliff. The car itself edges closer to the precipice with no further place to go. Is it parked or is its fate as gloomy as the seascape behind it? 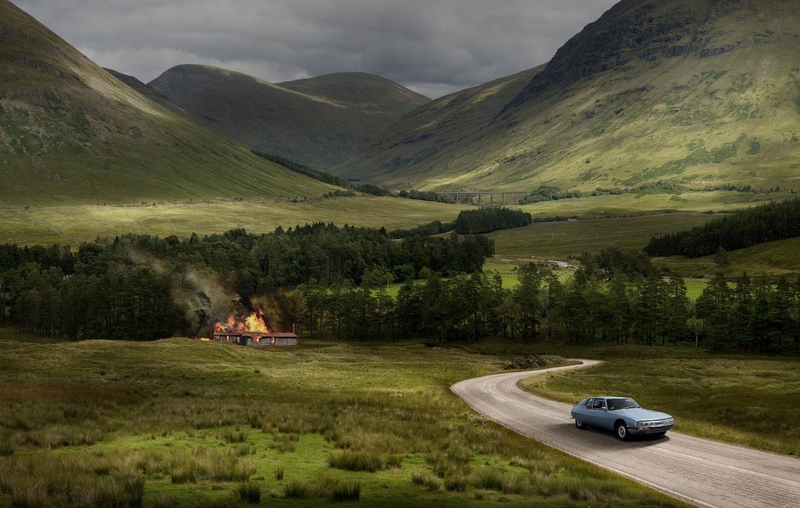 In “Untitled 6,” what appears to be another Citroen or perhaps a Peugeot is making either a fast getaway from a cabin ablaze or rushing to get help. You are forgiven if you think the former, but either way, this abode is beyond help. Two major themes seem to dominate much of the work seen in this exhibit at the Zodiac: fate and uncertainty as we have already detected in the examples above. But maybe no more so than in Dhervillers’ series titled Detachment. In this set, the last installment of a trilogy that includes, Hommages and My Sentimental Archives, the artist focuses on the Anabaptist Amish community by inserting Amish figures into or at the edge of the natural world. 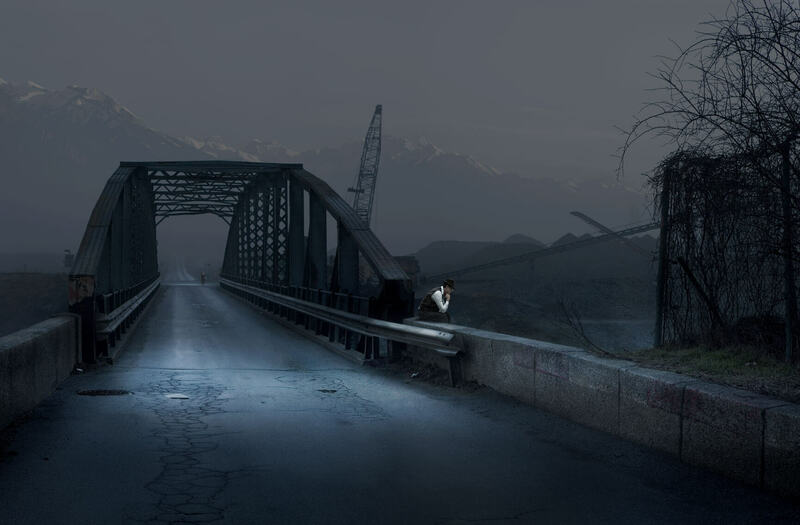 No more so than in his sublimely meditative “Untitled 6” that depicts a troubled Amish male sitting on a wall before a bridge too far…or to his destiny. He is clearly in unknown territory figuratively and spiritually, but the bridge and he are well lit. And at the other end of it stands a lone female figure that not only builds suspense but the promise of a new beginning. It’s a place we have all been. But Dhervillers must be hopeful here, unless that silver lining in the cloudbank we see in the distance is coincidental. Pathways, tunnels, bridges, creeks, roads and railways are a familiar motif in Dhervillers’ imagery as are archival vehicles and figures placed within or upon them. So are the barriers of the sea, mountains and woods that frame and isolate his subjects in these physical and mythical adventures. The outcome of each quest and journey is no more determined than our own. Perhaps the mystery of both is what entices us to his work. That, and the sheer sensuality of each image. Beyond that Dhervillers has no agenda. We aren’t told what to feel, or what to think if at all. The work is its own reason for being. Art theorists since the early 19th century have long espoused the French slogan, “l’art pour l’art” or “art for art’s sake,” to mean, one divorced from any didactic or utilitarian function. Artist Oscar Wilde evolved this theory into his humanistic aesthetic concerned only with the self, the individual rather than with movements of the day such as Industrialism or Capitalism. Wilde cautioned both artist and critic to transcend literal events and consider the “imaginative passions of the mind,” seeking not to explain a work of art but to deepen its mystery. Dhervillers’ “moving” pictures embody both, and in so doing, he raises the viewer to the level of pure art. 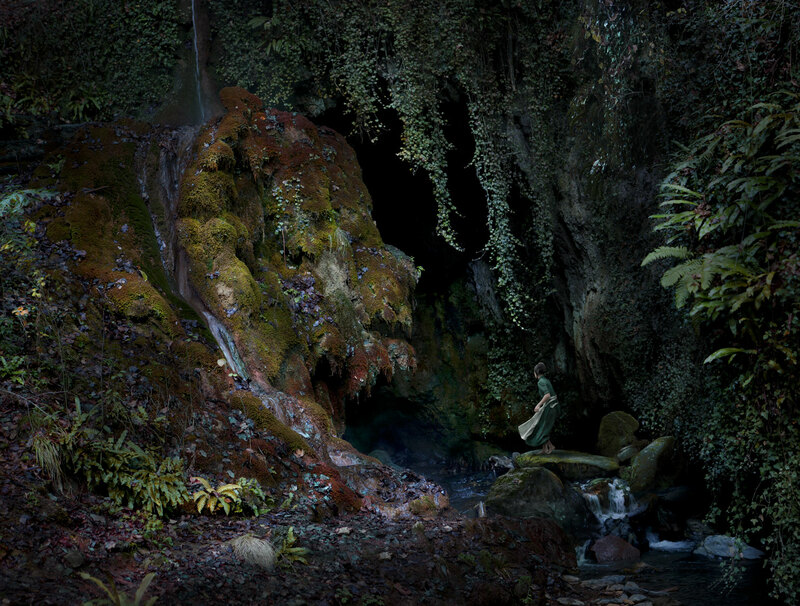 The Moving Gallery’s Nicolas Dhervillers is on view at the Garden of the Zodiac through April 1. The gallery, located at 1042 Howard Street in the Old Market Passageway, is open Tues-Sat from noon-8pm and on Sun from noon-6pm.